Mini-Review: Master Plan | SPACE-BIFF! Since our attempt to review the Minigame Library from Level 99 Games failed thanks to our complete inability to manage our expectations, I’ve decided there’s just nothing for it but to review each of the six (mini) games in a more traditional manner. First up is Master Plan, the only game where you’ll get to take part in an obstacle course game show for supervillains. The prize: one million one billion dollars (that’s the game’s joke, not mine). If the concept sounds lame, it’s because it is. If it doesn’t, then I’m afraid it is you who are lame, sir. Thankfully, Master Plan itself is a surprisingly good time. Yes, there are. You can’t overlap them, for instance, and you can’t measure the distance between cards when you place them. Other than that, you really can put them anywhere the span of the table will allow. See, the goal is to travel from your starting point to the million billion dollar prize at the other side of the table. Everyone begins side by side on indestructible starting spaces, and the goal is placed a couple feet away. On your turn, you’ll leap between cards that have been laid haphazardly between you and the prize, like a superpowered hippopotamus bounding between the few remaining rotten planks of a precarious rope bridge. This isn’t as easy as it sounds, because your supervillain opponents will be doing their darnedest to put dangerous cards in your path — stuff like trapdoors or bombs or teleporters. If you should happen to stumble onto those as opposed to benign or helpful spots, chances are you’ll find yourself right back at rectangle one. Play follows a helpful acronym, M.A.D., which stands for Move, Add, and Draw. This is probably a great way to remember the order of play, though for some reason my gaming group struggled with it. Maybe because of the carbon monoxide leak we’ve been ignoring for two weeks, though probably more because we didn’t expect Master Plan to be any good so it was a while before we sat up and began paying attention. You know, either/or. When you Move, you measure the distance between two cards with any card you’re holding in your hand, and if the distance between the two spaces is less than a card’s shorter edge, then you can make the jump. If the card you just moved to was face-down, you flip it up and resolve whatever it is. If it was face-up, you don’t activate it (it’s already gone off), but you can move an extra space (though you can only do this once per turn). You don’t take this action during the first round of play, since there wouldn’t be any spaces to jump to. Then you Add, which means you lay as many face-down cards as you want from your hand. As I mentioned above, you can place these anywhere, setting elaborate traps for your opposition, making fast-lanes of springboards for yourself, or setting up big red buttons to defuse tricky areas. Or — my personal favorite — just putting crap all over the place to psych everyone out. Last, you Draw a single card. Can he remember which card is which? It might sound like a game of Master Plan could take forever, since whenever you fall off the board you just go back to your starting space and get some new cards. It’s conceivable you and your group could fall into a horrible cycle of everyone laying out murderous traps for anyone who gets too close to the trophy, and finding yourselves stuck playing Master Plan for the entirety of your Saturday, like a hideous boardgame-themed Groundhog Day. However, a full game of Master Plan will only takes about 30 minutes tops, all thanks to Sudden Death mode. Once the draw pile runs out (which happens like that if you’re playing with four or more people), the discard pile is shuffled into a new draw and Sudden Death engages. Once that happens, falling off the board means you’re permanently out of the game, and the last man standing gets the million billion dollars by default. This creates a slick tonal shift in the mid-game. At the beginning, everyone is rushing headlong to get to the prize and not worrying too much about dying, since back in their starting space they can hop over revealed cards to catch up quickly, and chances are they’ll get to draw more cards than they have to discard from falling. Then Sudden Death kicks in and everyone’s tiptoeing around, trying their best to memorize who put which cards where, and terrified that when Steve laid down a card in the middle and a card near his position that he’s just set up yet another bomb to be remotely detonated from the safety of a big red button. Bomb, before and after, as activated by the white player’s big red button. “It’s surprisingly cerebral,” said one of my gaming buddies last night. He’s absolutely right: for such a short filler game, there’s a lot of potential to hatch cruel plots, or, even better, laser blasters to remove a card right out from under your buddy’s feet and send him to his probably-alligator-oriented doom. And falling into your own trap because you forgot exactly where you put that devilish card last turn, or getting caught in your own bomb blast, is sublime. Still, there are three things that hold me back from giving Master Plan the glowing recommendation I want to give it. We’ll start with the minor ones. First, its fun quotient is scaled directly to how many players you can bring to it. Four to six players make for the best experience, while playing with only two or three is a bit dull — with so few, it’s a very real possibility that someone will win by actually reaching the cash instead of being the last conniving jerk standing out of a pack of conniving jerks. Second, each of the six supervillains comes with an optional superpower. These are incredibly imbalanced; for instance, Dr. Badmahn gets to draw a free card if he places at least 3 cards on his turn. This sounds fine, right up until you hear about how Mysterious M gets to look at a face-down card anywhere on the table at the end of each of his turns, which makes it nearly impossible to trick him into stepping onto that teleporter you were going to use to steer him into your Perfect Trap. Other powers are similarly under/overwhelming, so it’s best to just ignore them. My third concern is a bigger issue: other than your starting space and the trophy itself, there are only nine varieties of cards, so there isn’t all that much surprise to be had after just a couple games. 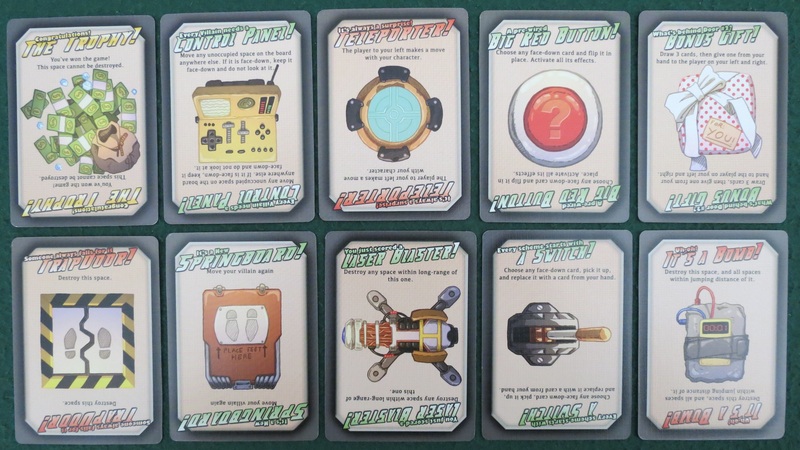 It seems like there was a lot of potential here for the designer to have just gone wild with it, adding all sorts of strange and wonderful cards into the mix — different styles of teleporters, minions, nefarious tools, of course alligators, game show-hating superheroes, etc. 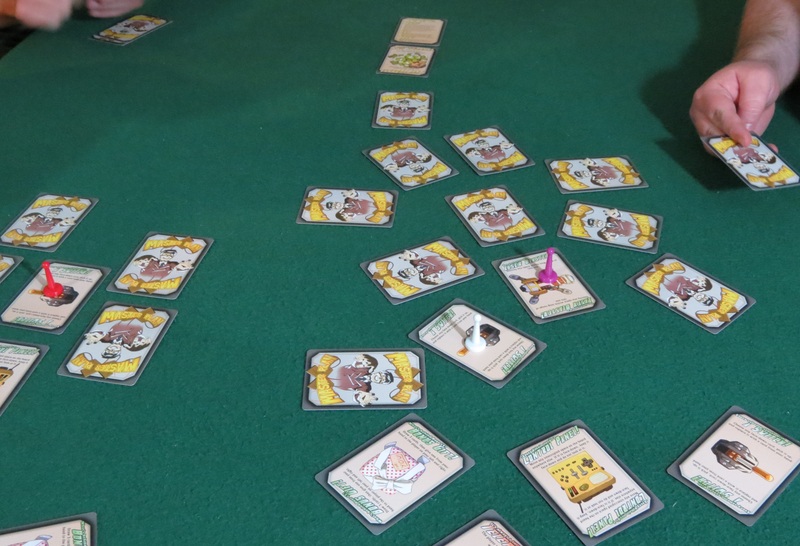 Instead, Master Plan is a very fun filler game that isn’t quite as complete as it could have been. Even so, I’m not complaining too much. It’s certainly better than I expected, and everyone at my table was laughing and having a great time while we played it, which is some of the highest praise I can give. We’ll definitely be playing it again. Posted on March 30, 2013, in Board Game and tagged Board Games, Level 99 Games, Master Plan, The Minigame Library. Bookmark the permalink. 5 Comments. Pingback: Mini-Review: Blades of Legend | SPACE-BIFF! Pingback: Page not found | SPACE-BIFF! Pingback: Tactile/Dexterity/Component Quest | SPACE-BIFF!